Outline: One who lived before He was born - Jesus. His miraculous birth; purpose of His coming to earth - to save man. Invitation. It is generally agreed that the length of a man's life is measured by the time between his birth and his death. However, there was one Man Who was born into this world whose life did not begin at the moment of His birth. This Man lived where hours and minutes and seconds do not exist. He has always lived in eternity except for a short time when He lived upon this earth. His earthly life lasted about thirty-three years. You ask, "Who was this Man? How did He come into this world? And why did He come into this world?" This man was Jesus Christ. In the Bible we read of Him in these words, spoken by God. "This is My beloved Son, in Whom I am well pleased." How did He come into the world? He came like all other men - He was born just as you and I were born. There was, however, one very significant difference in His birth. 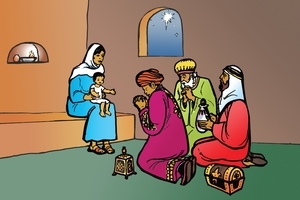 He was born of a virgin who was chosen by God for the purpose of bringing His Son into the world. The birth of Jesus Christ was a miraculous birth. The Bible, which is God's Word, says that Jesus was conceived of the Holy Spirit. This means that God Himself planted the seed of life in the womb of the virgin. Is this hard to believe? Would it be more difficult for God to plant the seed of life in a virgin's womb than it would be for Him to create the atom? In the beginning God created all things. He formed man from the dust of the earth. If so, He could most certainly implant the germ of life in the womb of a virgin. The Bible says Jesus was born of the virgin Mary. Here is part of the account of His birth. "Then Mary said to the angel, `How shall this be, seeing I know not a man?' And the angel answered and said unto her, `The Holy Spirit shall come upon you, and the power of the Highest shall overshadow you: therefore also that holy thing which shall be born of you shall be called the Son of God.' And she brought forth her first born Son, and wrapped Him in swaddling clothes, and laid Him in a manger; because there was no room for them in the inn." Why did Jesus come to this world? There is only one reason. He came that all men might be saved from sin. Does this statement shock you? If it does, then listen carefully to these words from the Bible: "For God so loved the world that He gave His only begotten Son, that whoever believes in Him should not perish, but have everlasting life. For God sent not His Son into the world to condemn the world; but that the world through Him might be saved. He that believes on Jesus is not condemned, but he that believes not is condemned already, because he has not believed in the name of the only begotten Son of God." Jesus Christ, the Son of God, is the Man Who lived before He was born. Now that you have heard this, what should you do? The Bible tells you. It says, "These are written that you might believe that Jesus is the Christ, the Son of God, and that believing you might have life through His Name." "For with the heart man believes unto righteousness; and with the mouth confession is made unto salvation." Do what the Bible says. With your whole heart believe and trust in Jesus Christ; pray and tell Him your need of Him as Saviour. Open your heart and receive Him. Thank God for Him, for He has said, "He who hears My Word, and believes on Him Who sent Me, has everlasting life, and shall not come into condemnation, but is passed from death to life." GRN has recorded a version of this script in 3 languages and dialects. See full list.